After a long hot summer in Southern California, it’s finally Fall. At last, the evenings are getting cooler… even if the days are still warm. Such a welcome change! 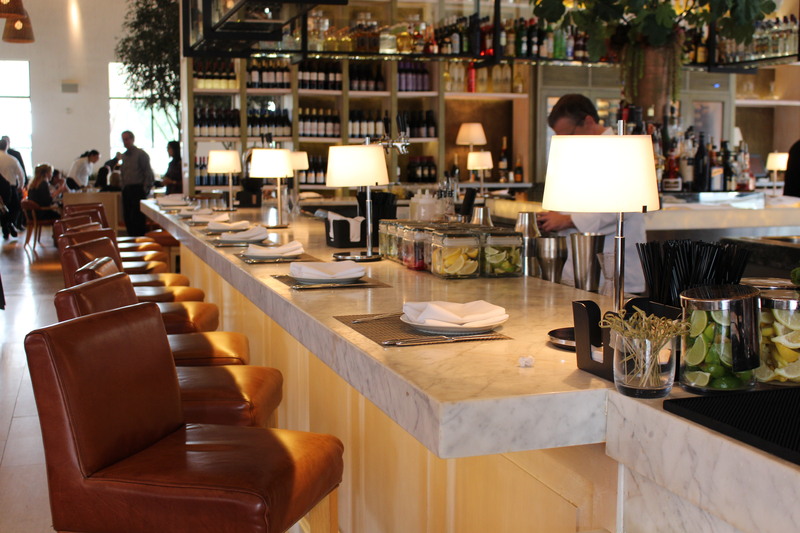 And with that, menus are changing to celebrate the season’s ingredients… chestnuts, squash, beets, mushrooms, pears. I am a huge fan of Fall foods, so when I was invited to a dinner to taste some of Fig & Olive’s latest seasonal dishes, I was more than happy to oblige! 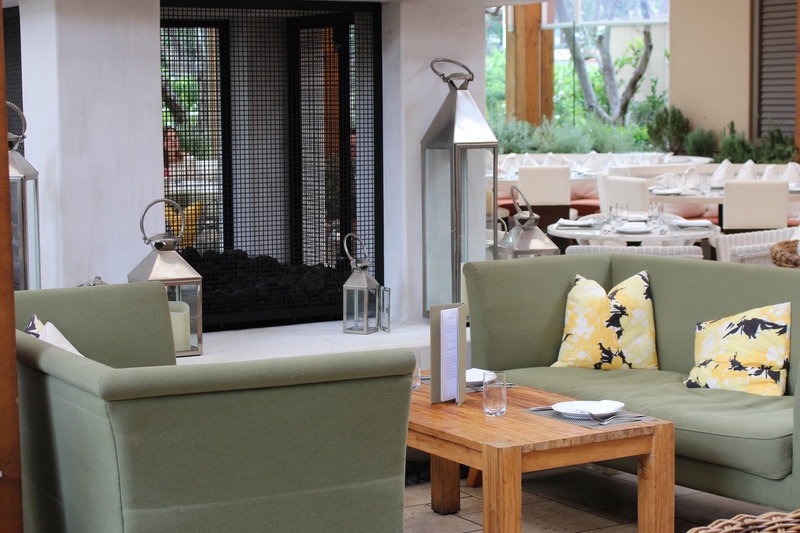 If you’ve never dined at Fashion Island’s Fig & Olive in Newport Beach, the atmosphere is calm, open, airy, and elegant with a lounge area, an outdoor patio, and an all white indoor dining room. We were seated in the softly lit dining room inside. So calm, so relaxing, and the perfect setting for a date night. So what was on the Fall menu? 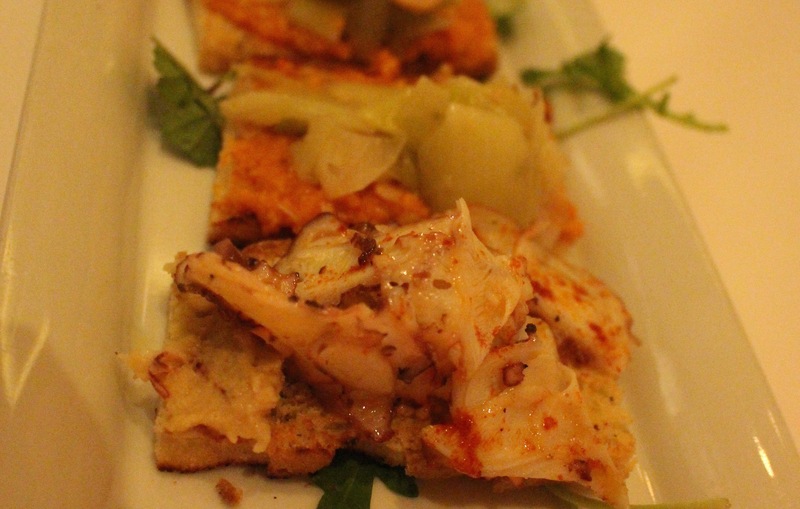 We started with a trio of crostini: Tender thinly sliced octopus was set atop creamy hummus with a light dusting of pimenton, aka paprika; crisp julienned red apple was paired with gorgonzola, and red pepper marmalade; and grilled leek with red pepper romesco and chopped hazelnuts. The crostini, a popular sharing item at Fig & Olive are the perfect starter while considering the menu with a cocktail. 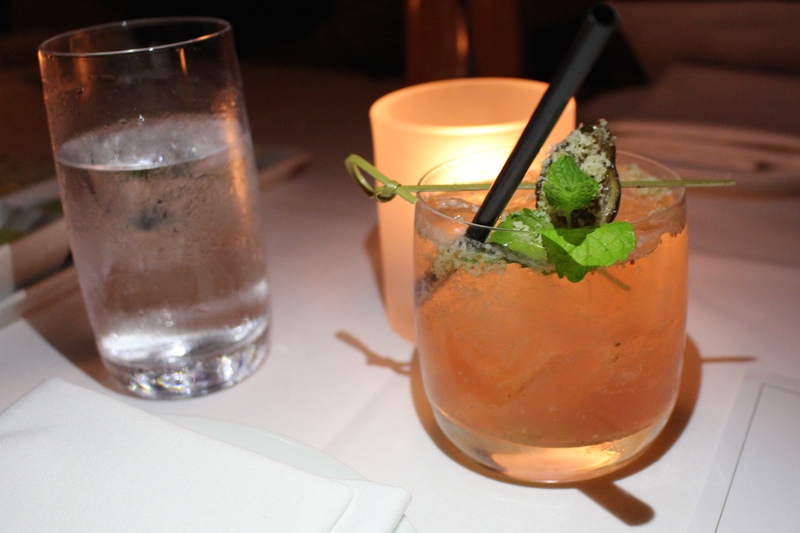 Speaking of cocktails, bourbon has cool weather written all over it as do figs and walnuts and so I gave the Fig & Walnut Julep a try. This smooth concoction of bourbon, elderflower liqueur, port, muddled black mission figs, garnished with mint, lime and shaved walnuts is the perfect pre-meal sipper. I have to get my hands on the recipe to serve with Thanksgiving appies perhaps. Seared Fall Sea Scallops served over a salad of cauliflower, semolina, parsley, cilantro, lime juice, and almond oil, with a sprinkling of slivered almonds, a light citrus dressing and dots of roasted cauliflower puree completing the dish. 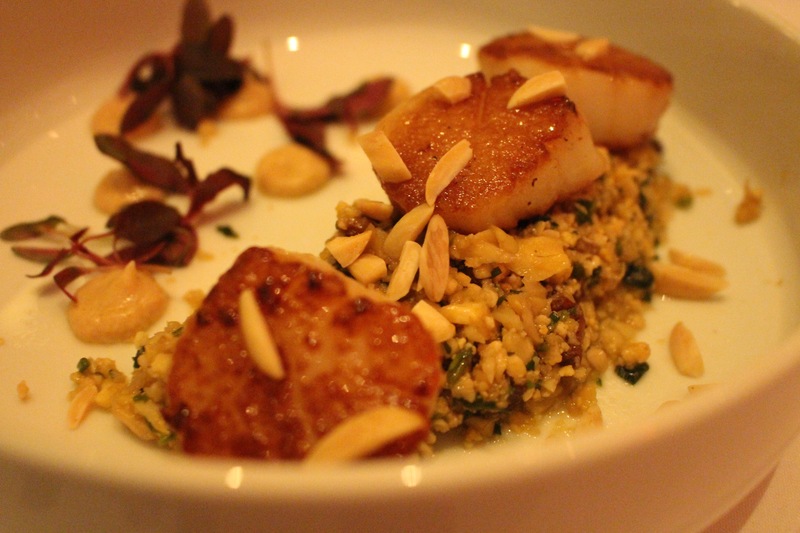 So much texture, going on here meanwhile the nicely crusted scallops remain the star. And the Burrata & Heirloom Beet. While listed as an appetizer, this could almost pass for a salad. 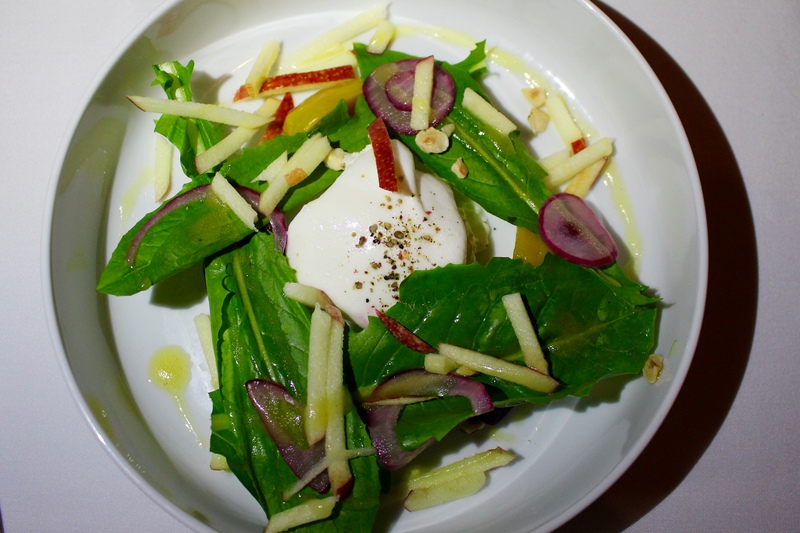 A nice mound of luxurious, creamy burrata is served with roasted baby beets and is garnished with a few dandelion leaves, julienned gala apples, pickled onion, chopped toasted hazelnuts, and a drizzle of honey apple cider dressing. There are also two new salads celebrating the flavors of Fall: The Insalata di Fregola; and the Salade d’Automne. I’ve been noticing fregola, a semolina pasta shaped into teeny tiny little balls that are toasted in the oven, popping up on more and more menus. I’m a fan. The pasta offers a nutty and slightly chewy element to dishes and is perfect when tossed with a few vegetables for a satisfying salad course that can stand on it’s own as a light meal. 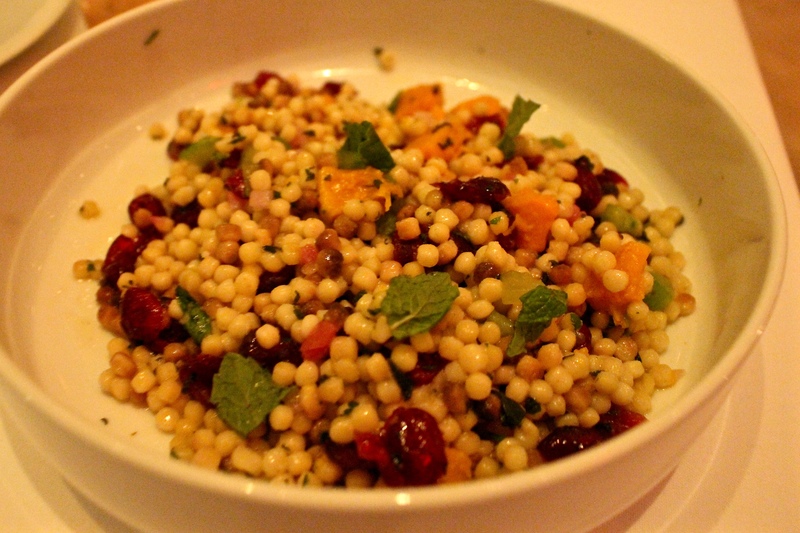 The Insalata di Fregola was tossed with roasted butternut squash, celery, pickled onion, dried cranberries, mint, parsley, and a light citrus dressing and was one of my favorite dishes of the evening. I loved how you could taste each of the ingredients and the wonderful texture of the individual little beads of fregola in my mouth. 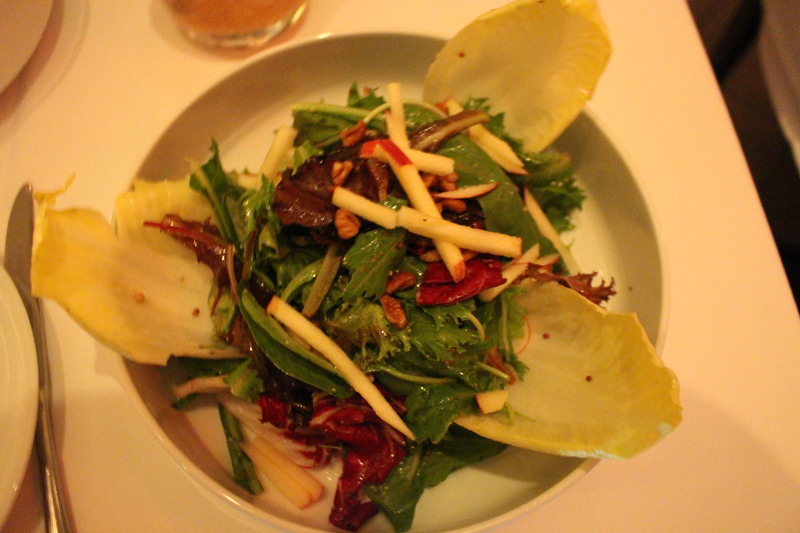 The Salade d’Automne was a more traditional salad with whole endive leaves, torn radicchio, mesclun, radish, julienned gala apple, and candied pecans, punctuated with less traditional ingredients like pickled mushroom, dandelion, and purslane… a healthy weed showing up on more and more menus of late. The whole grain mustard dressing is well balanced and brought the sweet and bitter elements of the salad together perfectly. Other than ordering our cocktails for the evening the only decision we had to make was which entrée to order. I definitely knew I was going for one of the new dishes: The Fall Vegetables Linguine; or the seared Riviera Salmon. The Fall Vegetables Linguine with artichoke, sautéed cremini mushroom, radicchio, red onion, pine nuts, parmesan, lemon zest and an artichoke cremini puree sounded the most Fall like to me. 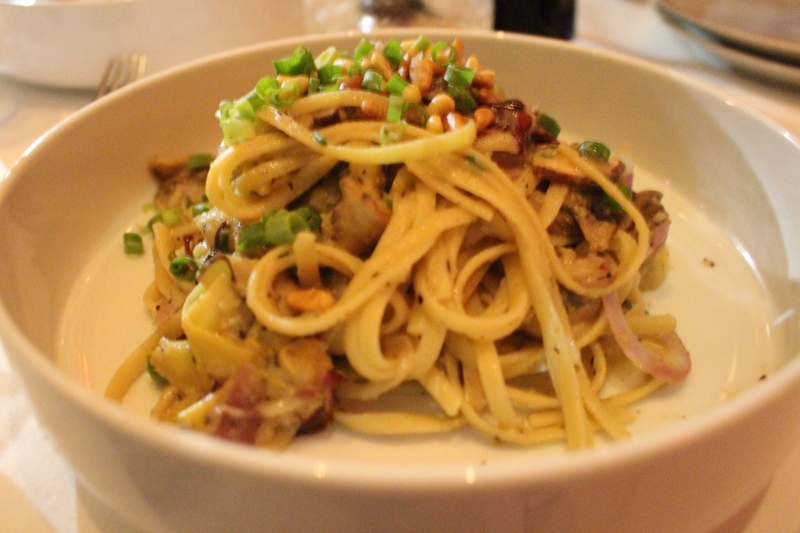 The pasta was perfectly cooked… and was that a hint of truffle oil flavor I detected in there? I do believe so. I hate myself when I succumb to pasta, especially twice in one evening, but it was worth it. And to finish our meal… dessert. What fruit says Fall more than pear? 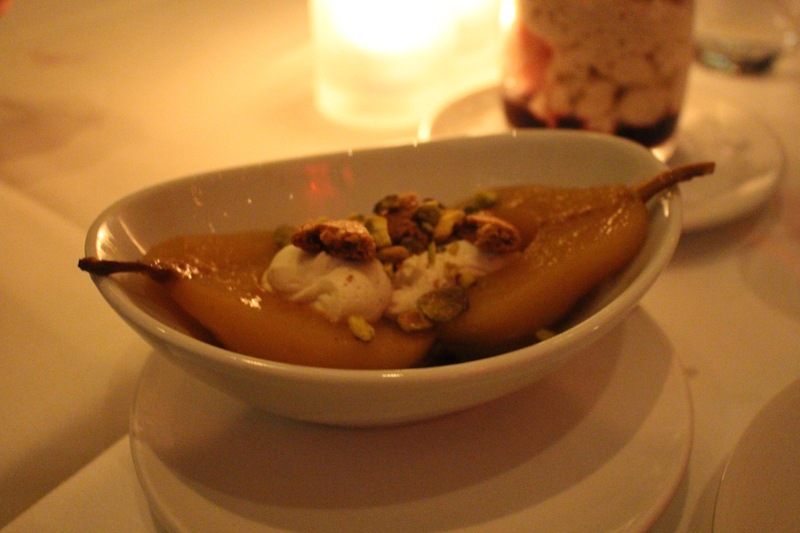 This Poached Pear in Spiced Orange Juice is halved and filled with a light whipped mascarpone and topped with crumbled ginger biscuit and pistachios. A nice light ending. 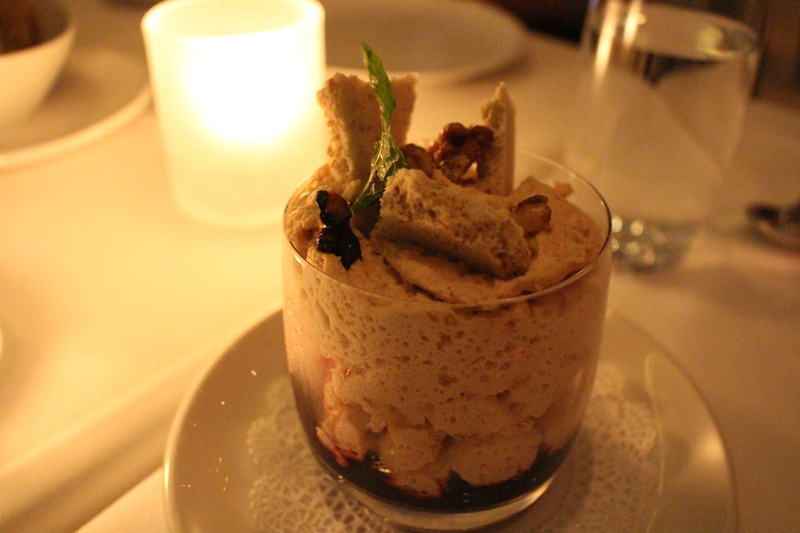 And, my favorite of the two, a decadent chestnut mousse with Amarena cherry and crumbled cookie. I was only going to try one bite, but the creaminess of the mousse and the crunchiness of the cookie, combined with the sweet and sour bite of the cherries was more than I could resist. Oh well. Maybe next time I’ll have more self control. Pffft… who am I kidding? 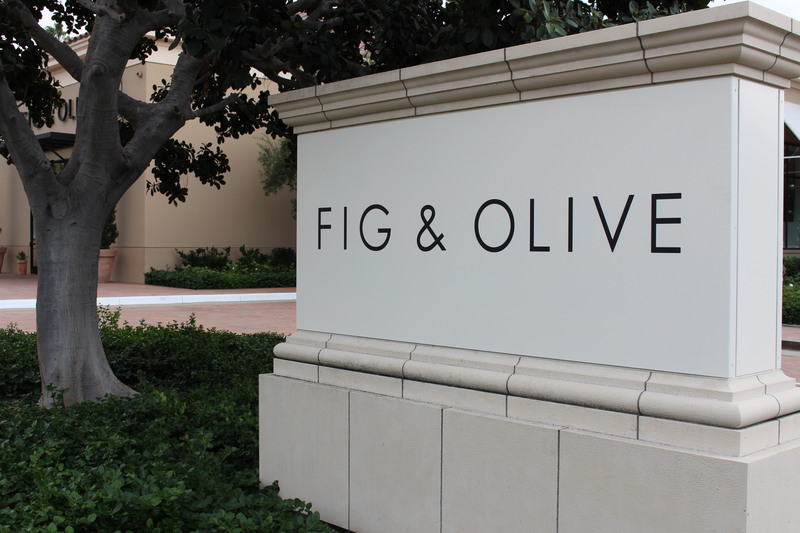 Fig & Olive is located at Fashion Island in Newport Beach and is opened daily for lunch and dinner, with brunch served on weekends.